Martin Kemp’s chapter serves as a contrast and also partial confirmation of Jordanova’s approach. 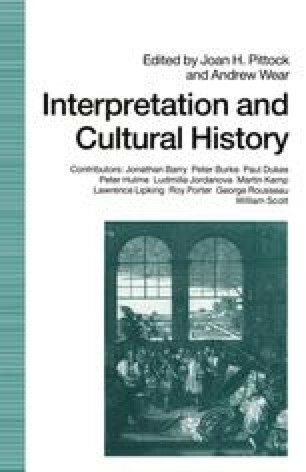 Kemp writes that the existence of rigidly demarcated intellectual disciplines means that cultural artefacts are often put into interpretative categories which do not reflect their real nature. The plea for cross-disciplinary study (which Kemp realises will be difficult to fulfil) goes together with a rejection of the fashionable semiotic readings of texts which are intrinsically reductive of the variety and vitality of cultural artefacts. Clearly, Kemp from his particular background in art history, wants to keep the individual and the untidiness of history in the foreground and is suspicious of any historical determinism, whatever the amount of mediation that may lie between cause and effect. Yet, although from a very different theoretical position, he, like Jorda- nova, sees the value of cultural history. Kemp’s vision of the new history, especially as regards the history of style, is that of a loose, intuitive, associationist technique so that the true nature of similar objects and their social contexts can emerge uninfluenced by the categories of pre-existing taxonomies.